Believe it or not, you can get a lot of work done on your smartphone. With the right collection of apps, you could knock out most of your workload on your way to the office. These apps will help you manage meetings, sign contracts, keep track of your expenses, and perhaps even depart early. Formerly the Google Docs app, Google Drive gives you easy access to the entire contents of your Drive while you’re out and about. That means you can access not only your Google Docs files but also anything else that you’ve uploaded to Google’s cloud storage. In addition, you can use the app to upload files to your Drive, or create brand-new ones in Google Docs. You can share your Docs items with other people, and collaborate on the files in real time. Tracking digital receipts can be a hassle: You can easily lose them within the confines of your inbox, and they can quickly accumulate if you frequently shop online. OneReceipt organizes your digital receipts and helps you manage your paper ones as well--use the iPhone’s camera to take a picture of a paper receipt, and the app will digitize the information for quick lookup. The service also scans your email inbox for receipts from online stores, alerts you when your product has shipped, and provides a monthly summary that tells you how much you are spending. In handling multiple calendars, Business Calendar Free blows the regular An­­droid calendar app out of the water. This tool works seamlessly with Google Calendar, and it automatically imports all calendars tied to your accounts. The app’s clean presentation makes it easy to see when you have an event coming up, and you can quickly set appointment reminders. Several included customizable widgets can display a specific calendar or events--handy for checking your schedule at a glance. The creators also offer an ad-free version for $5. Security is a major concern for any business, especially when it comes to safeguarding passwords. mSecure Password Manager provides a safe place to store your sensitive passwords, acting as a vault for all of your login information. It keeps your stored data encrypted and locked away from prying eyes, and you can set the app to back up the data to mSecure’s cloud. The app also provides a built-in password generator for locking down your online accounts more effectively. Both Android and iOS can view PDFs natively, but neither OS lets you do much with them. Through the Adobe Reader app, you can both view and edit PDFs. You can leave comments, add bookmarks, and even use the freehand tool to mark up documents as you see fit. The app’s best feature, though, gives you the ability to fill out simple forms and sign your documents digitally. You’ll no longer have to waste paper and time printing a document just to fill it out. 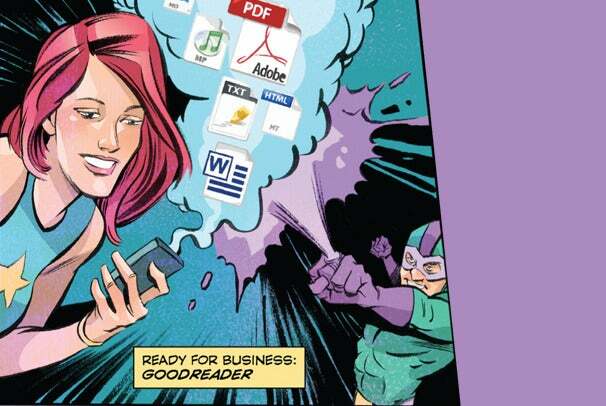 The versatile GoodReader can handle more than just PDF files; it can also open .txt files, Word documents, and pretty much anything else you throw at it. Like the Adobe Reader app, GoodReader will allow you to mark up PDFs with notes and comments. Unlike the Adobe Reader app, GoodReader can also import documents from your Google Docs account, Dropbox, Box.net, or any number of server types. You can even set the app to sync the changes you make to the imported documents, so your files are always up-to-date. The social network for professionals, Linked­In offers an app for Android and iOS that does more than help you stay up-to-date with your connections. The news section, for instance, delivers the hottest stories of the day related to topics that you follow; the stories open within the app’s browser, and you can share any article you’re reading with your LinkedIn network. The app also lets you sync your LinkedIn contacts with those in your address book, so you can easily get in touch with them whenever you need to.